Today is blustery and we’re getting buried in tons of fresh snow. 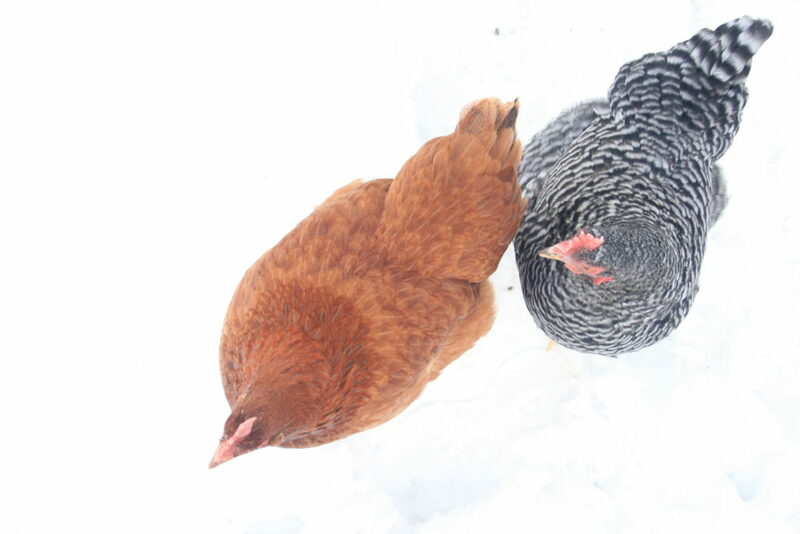 It’s the ever-changing face of Minnesota winter. Just yesterday there were puddles from the warm thaw! That warmer weather was such a cause for celebration after the deep freeze we were in for quite a long time. All we humans, plus the bees and chickens were so thankful. For myself, I admit, the gardening bug did strike! 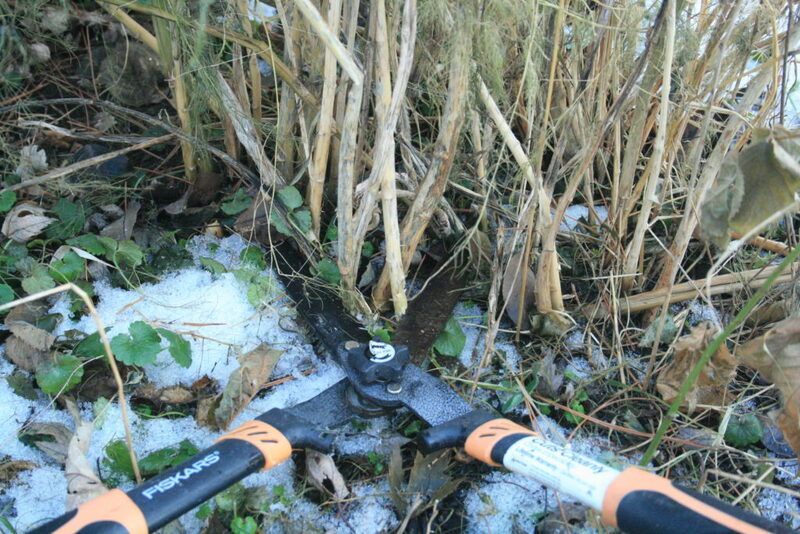 In fact, I had the perfect gardening task to accomplish – I cut back the bushy row of dead asparagus fronds. It’s advised to do this in the Fall once the greenery has died, but we usually get snow before mine have died. It’s ideal to have the dead brush removed by Spring so that the soil warms easily and no debris stands in the way of those glorious asparagus shoots erupting as soon as possible! I was so very happy to be working in the garden in January, but GAH! Creeping charlie! Look how green it is! Doesn’t it ever die?! My asparagus bed is overdue for a thick layer of compost and mulch to keep those weeds at bay. When you cut your asparagus back, you’re left with massive amounts of vegetation. Here in the city, I see so many people shove this kind of thing into those yard waste bags so the city can take it away. You know why they are willing to take it for you, don’t you?? Because it turns them a profit! From all this vegetation, you could build a solid compost heap. Alternatively, I stuffed mine along the blackberry fence line to serve as a thick mulch. Here, the morning glories are attempting to kill all my fruit bushes, so I’m beginning combat early. (Please, for your own sanity, never plant morning glories! They are my #1 gardening enemy!) Save for the weeds that have already gone to seed, basically any kind of vegetation you are trying to dispose of makes for excellent mulch. We really can’t have enough mulch in our gardens! For more on that topic and a book rec that will change your gardening forever, check out this post. 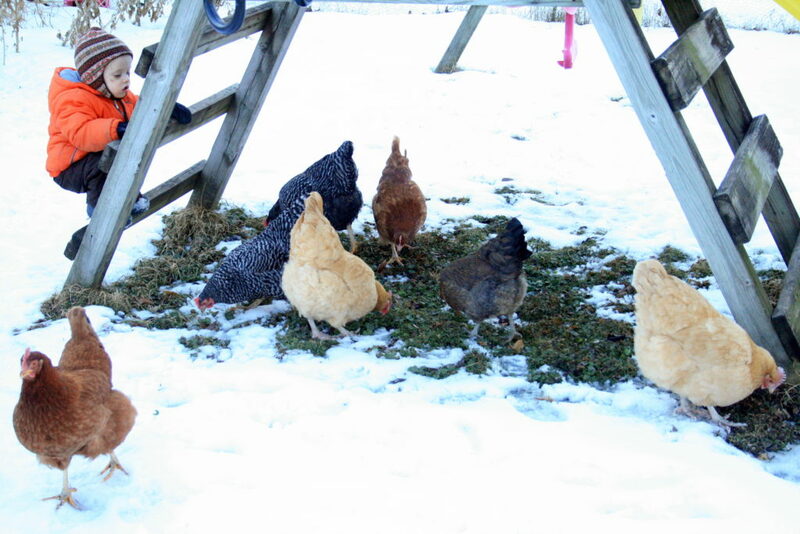 As for the other living creature on our lot, the chickens started roaming the yard again, which made me so very happy. They managed to find a patch of grass under the platform of our slide, and a bed of exposed leaf mulch. They do so love to scratch all my mulch around. It drives us all batty to have the sidewalk covered (again) in mulch, but with the scarcity of dirt out there, I let them at it. Little E managed to slug up the slide ladder even in all his snow gear again and again and again… while the 7 yo built an elaborate house with pruned branches from our Christmas tree. With great excitement she included a sauna in her design. 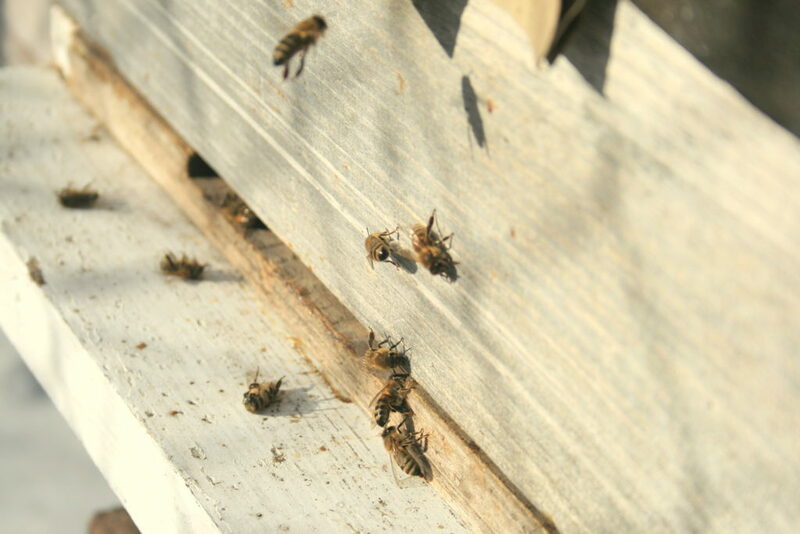 Even the bees made a brief appearance to take an “elimination flight,” and clear out the dead bees blocking the hive entrance. I watched them for a bit and decided their endeavor was a risky business. Without the warmth of the cluster, the lone bee sometimes seemed as if she were slowing from the cool air. I worried she would freeze to death, and I couldn’t help myself but to lift a bee or two into the entrance before it was too late for her! It was an exciting glimmer of the endless days of outdoor play and work that await us! I must admit that although I’m still extremely sad our farm purchase fell through and we will not be spending our summer in the country as we anticipated, I am glad to not be moving in Spring so I can have a very productive garden after all! My Baker’s Creek catalogue has oddly not yet arrived so I’m missing drooling over their photos. I was planning to order more seeds from High Mowing Organic Seeds than in previous years, anyway. I love Baker Creek’s massive array of heirloom varieties, but I’m really impressed that High Mowing’s seeds are ALL organic! Being a smaller company, too, I’m eager to support them. On to seed inventory and whittling down all my desires (which is always so very difficult)! 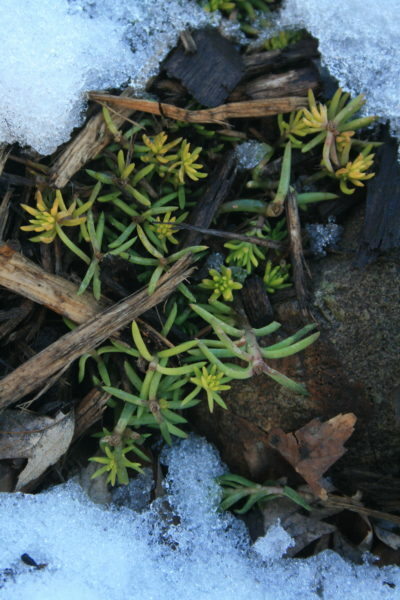 What does your January garden look like?